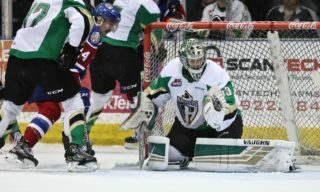 RAIDER REVIEW: The Raiders (41-7-0-2) host the Moose Jaw Warriors (28-11-6-2) at the Art Hauser Centre on WHL Suits Up with Don Cherry to Promote Organ Donation Night Presented by RE/MAX. 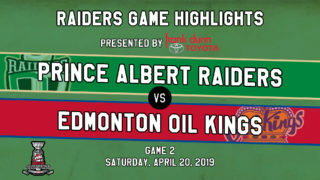 Last night, the Raiders fell 6-3 to the Edmonton Oil Kings in their return to the Art Hauser Centre following their BC road trip. Cole Fonstad led the Raiders’ attack with two goals. Noah Gregor also chipped in two assists. Brayden Pachal was the Raiders’ other goal scorer. Ian Scott made 22 saves in a losing effort. 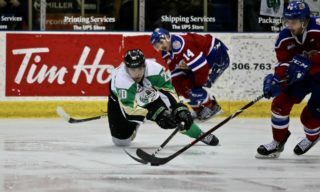 VS. MOOSE JAW: This is the fourth meeting of the year between the Raiders and the Warriors and second in Prince Albert. The Warriors won the last meeting between the clubs on Jan. 4. 20 GOAL CLUB: Winger Cole Fonstad reached the 20-goal plateau for the second time in his WHL career on Friday with a pair of goals. The Montreal Canadiens prospect is one goal away from tying his career high set last season. His second goal of the evening was also the 150th point of his WHL career. 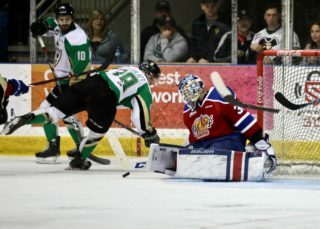 Fonstad became the sixth Raider this season to hit the 20-goal plateau, tying the Lethbridge Hurricanes for the most players with 20 goals on the roster. FIVE STRAIGHT: With a goal on Friday night, captain Brayden Pachal stretched his point streak to five games. This is the third five-game point streak of the season for the Estevan product, which is also his career best. Pachal’s 13 goals on the season has him in third place among WHL defenceman, trailing Vancouver’s Bowen Byram and Edmonton’s Conner McDonald. Pachal has 23 assists to go along with his 13 goals this season. FIRST TO STRIKE: Precedent was in the Raiders’ favour when they scored the first goal of the game on Friday. However, the Raiders lost for just the second time in regulation after opening the scoring this season. When they strike first, the Raiders have a record of 32-2-0-1. The only other regulation loss was also to a Central Division opponent – the Red Deer Rebels on Oct. 6 at the Enmax Centrium. 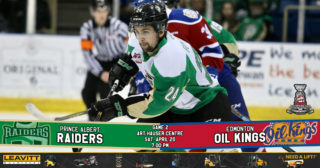 NEXT UP: The Raiders hit the road for Edmonton on Monday night for a rematch against the Oil Kings. Game is 8 p.m. The next Raiders’ home game is on Friday, February 15 against the Brandon Wheat Kings. Puck drop is 7 p.m. Tickets are available at raiderhockey.com and the Raider Office.